Bullwinkle the moose is alive and well in the Greater Yellowstone Ecosystem and when you see your first moose you will wonder about how cartoon like the Moose really appears. Funny looking is one way to describe them but here is how it happened. When God was finished creating all the animals of the earth he had a bunch of animal parts left over, and not wanting to let anything go to waste he figured he would try to piece together another animal. God took some giraffe legs and attached them to a horse torso and capped it with a hump from a grizzly bear. He wasn’t sure how the long face of an Englishmen ended up in the animal spare parts pile but figured it would balance the large torso so one it went. The long ears of a mule were a natural so on they went. This might be a good use for the mule deer antlers that had been flattened by accident; they would make a nice crown. Something must balance the bottom of the tubular proboscis, as this creature is looking a bit odd, so on went the dewlap of a cow for the final touch. He couldn’t find any extra tail anywhere so this creature would have to go without. That is how a moose came to look as if an animal made from leftover animal parts. All the years I have been guiding around Yellowstone it has always surprised me that the animal the visitor wants to so most isn’t the wolf or the grizzly bear, it is the moose. 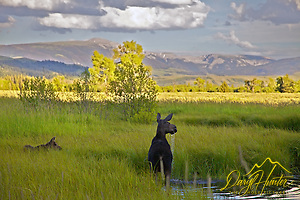 The Shiras moose also known as Wyoming moose is the smallest of North America’s moose; however, it is still quite large. The Shiras moose are found in Wyoming, Montana, Idaho, British Columbia, and in isolated areas of Utah, Colorado, and Washington. The Shiras Bull Moose has smaller antlers than the Canada moose. Its body color is a rusty-brown to black with pale-brownish saddle, and its legs are gray to white. The Shiras cow moose are slightly smaller than the male and do not have antlers. The bulls can grow to seven feet tall at the shoulder and can reach ten feet in length. Mature Shira’s moose weigh 600 to 1,400 pounds. The cow moose weigh between 500 and 1,200 pounds, about the size of a horse. Bull Moose have antlers that can span five feet and weigh up to 50 pounds. It has smaller antlers than the Canada moose, and the antlers are shed between November and January. Breeding occurs from mid-September through mid-October. 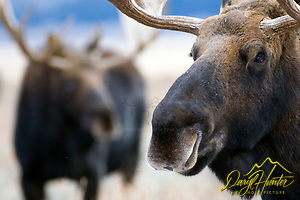 Cow moose attract males with both calls and the scent of estrous. 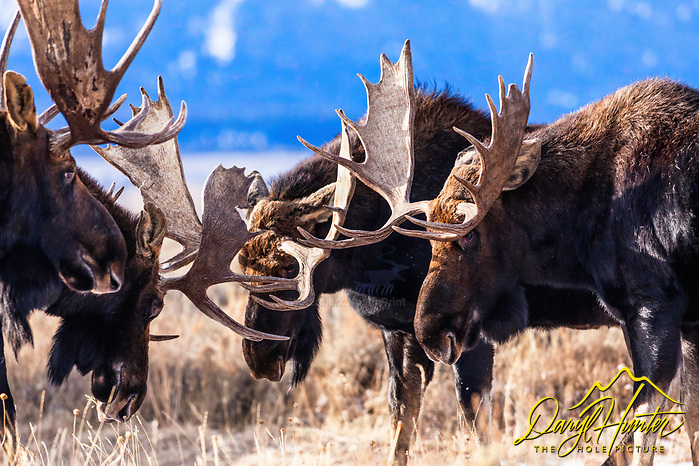 Bulls as do all ungulates engage in fights with other bulls to win the right to breed the cow moose. Bull moose behavior during mating season includes scraping their antlers on trees, creating wallows to roll in, not eating causing large weight loss and they become more aggressive than usual and may charge at people and cars. Although this is when they are in their prime use all due caution when photographing them this time of the year. Cows start breeding at one and a half years old. Gestation is approximately 230 days. Most calves are born near the end of May. Gangly little creatures all legs no body. Cows usually give birth to one offspring but if the range is healthy two calves aren’t uncommon. Calves have reddish-brown coats and weigh 24 to 35 pounds at birth. A yearling calf will stay with its mother until new calves are born. Calves weigh 300 to 400 pounds by fall. Moose habitat varies with the season. In spring and summer they can be found in marshy areas, meadows as well as higher elevations. During winter moose prefer forest but can often be found in valley bottoms eating willow bushes. Before the fall rut bulls tend to remain in one area for long periods of time. Moose are browsers and feed on leaves twigs, bark, and buds of trees and shrubs. In the summer moose feed heavily on aquatic plants and can often be found with their head under water eating something off the bottom of a pond. Moose will eat about 50 pounds of food a day. In the winter, the best place to look for them is in the bogs that are rich in the willow bushes they thrive on in winter. It is said in Alaska that the most dangerous animal in Alaska is the moose. It is not that moose are more fierce or aggressive than bears, it is because more people are injured and killed by moose because many people think that moose are giant cartoon characters and consequently don’t give them the room they need to feel comfortable. Most animals have a “fight or flight distance” the shorter an animals fight or flight distance is the more likely they will fight instead of flee. Moose, bear and bison all have short fight or flight distances. The lesson being When observing or photographing moose don’t mistake their docile inspection of you as tameness because they are just trying to figure out if they want to trot into the woods or to kill you. Posted on Wednesday, March 21st, 2012 at 12:51 pm. Filed under: Wildlife Tags: behavior, bull moose, description, ecosystem, fighting moose, Grand Teton National Park, Greater Yellowstone, habitat, Jackson Hole, moose, photos, shiras	RSS 2.0 feed.